Henry tells Bronwyn that he thought they'd be together forever - marriage, kids, the works and tells her not to throw it away over a silly misunderstanding. Bronwyn says she's upset because Henry didn't trust her and it really hurt. She won't give Henry the chance to hurt her like that again. Jane suggests that Toby apologises to Katie for eating garlic before kissing her in the play. He laughs but says he will. Sharon tells Lucy that she's really sorry for throwing her in the pool and Lucy says they can be friends. Mark quietens everyone down so he can make an announcement - he and Jane have got engaged. Everyone looks really happy except Des who looks upset. Harold wishes everyone a Merry Christmas and they all sing. Joe and Toby come in for their dinner. Aunt Edie is frosty with Joe who addresses her as "Duchess". She is a bit concerned at their lack of vegetables and tells Joe he should be ashamed of himself. She stomps off to the kitchen complaining about the lack of a dishwasher. 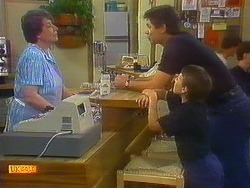 Joe tells Toby that he knows where he can get a dishwasher cheap. Nick is teasing Henry about the girls that rejected them. Henry spots Des, Sharon and Jamie coming up the beach and Nick groans. They greet each other and Nick and Sharon take Jamie off to play in the sea. They chat awkwardly and Sharon says they should just be normal with each other again. Henry asks Des is Bronwyn is coming to the beach. Des says yes - she was waiting for her boyfriend to pick her up. Henry is clearly upset at this. At that moment Bronwyn arrives with a bloke called Russ. She introduces them and they shake hands, but Henry looks gutted. Toby goes out for a walk while Joe is finishing his coffee. Jane comes in and tells Joe that apparently Nolene has been over at their place looking for them. Joe is worried that she wants Toby back. Joe doesn't want him to go back - they're mates now. However, he doesn't see he's got much choice. Jane says he could talk to Nolene about access to Toby on weekends. Toby comes back and Joe tells him that they have to have a bit of a talk. Henry is whinging to Nick about Russ. He reckons he's a meathead and has nothing going for him except his good looks. He asks what Russ has that he doesn't and Nick says, "Bronwyn!" Henry is not pleased and says he'll sort Russ out. Henry hands out icecreams he's bought. He accidentally dribbles some on Bronwyn's leg and wipes it off. Russ takes offence at this and says that noone touches Bronwyn's leg except him! Henry and Bronwyn are back from the beach. He is cross that Bronwyn is going out with Russ, but Bronwyn says she and Henry split up ages ago and she didn't think he'd mind. Henry says some hurtful things about Bronwyn's list of blokes she's been out with. Then he storms out. Joe and Des come in and Joe is trying to flog Des a dishwasher for the Coffee Shop. Des reluctantly agrees. Toby is preparing some food for the barbecue. 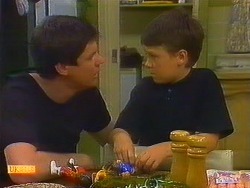 He suddenly tells Joe that he doesn't want to go back to Nolene - he wants to stay with Joe. Also he doesn't want a new dad because he's already got Joe. Joe hugs him and says it will all work out. AUNT EDIE: Oi! Would you mind putting that thing out please, I've got my washing on the line. 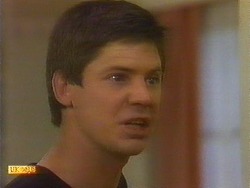 JOE MANGEL: Yeah, I do mind. And you're trespassing on our property. AUNT EDIE: I am not! JOE MANGEL: Your nose is! 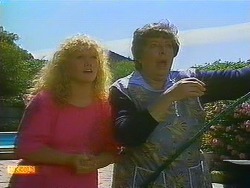 When Sharon realise it's her washing on the line, she turns the hose on the barbecue. Joe climbs over the fence and thinks it was Aunt Edie who used the hose on the barbecue. He vows that he'll get her back. Joe is seething about what happened to his barbecue. Nolene arrives at that moment and Toby hugs her. She congratulates Joe saying that Toby is looking well. Then she introduces her new husband, Ted. They shake hands awkwardly. Jane leaves them to talk and hugs Toby goodbye. Joe awkwardly offers them a drink and goes off to make them. Nolene asks Toby to give his "new dad" a hug but Toby says he doesn't want to. Ted tells him that he'll get a hiding instead if he's not careful and Toby looks petrified. Toby reluctantly hugs him then backs away. Ted says he's the boss now so he either does as he's told or gets a clip around the ear. Joe comes back with the drinks and Ted reverts to being a nice bloke. Toby sits on the sofa with his mum looking very scared. Henry is feeling down about Bronwyn. Nick can't believe that the coolest dude in Erinsborough wants to stay home on a Friday night because he's got girl problems. Henry suddenly changes his mind and runs off to change. Jane and Bronwyn are talking about Henry while Jane tries on her wedding train. She thinks that the fact that both Bronwyn and Henry are upset about what happened between them proves that they both care about each other. Jane starts to try on her wedding dress but suddenly Des drives up so she goes to change in Bronwyn's room. Des comes in with a chicken and asks her to cook it if she's not going out with Russ. Bronwyn says she's not bothered about Russ. Des is surprised and says it was a pretty short romance! Jane comes out in her wedding dress and Des says that Mark is one hell of a lucky fella. Joe has served up dinner and Nolene suggests that Joe could have Toby every second weekend and every other school holidays. Joe is rather takenaback when Ted interjects that Joe has better things to do than keeping a little coward of a kid in line. Toby puts tomato sauce on his dinner and spills it. Ted hits him on the head. When he goes to hit him again, Joe catches hold of his arm and tells him that if he hits his son again he'll be drinking his dinner through a straw. He quickly sends Toby off to his room. Joe says he doesn't like the way Ted treats his kid. Nolene and Ted get up to leave and Nolene says that Joe can forget about access. But Joe says if they take Toby away from him he'll give them a lesson in what it's like to pick on someone their own size.